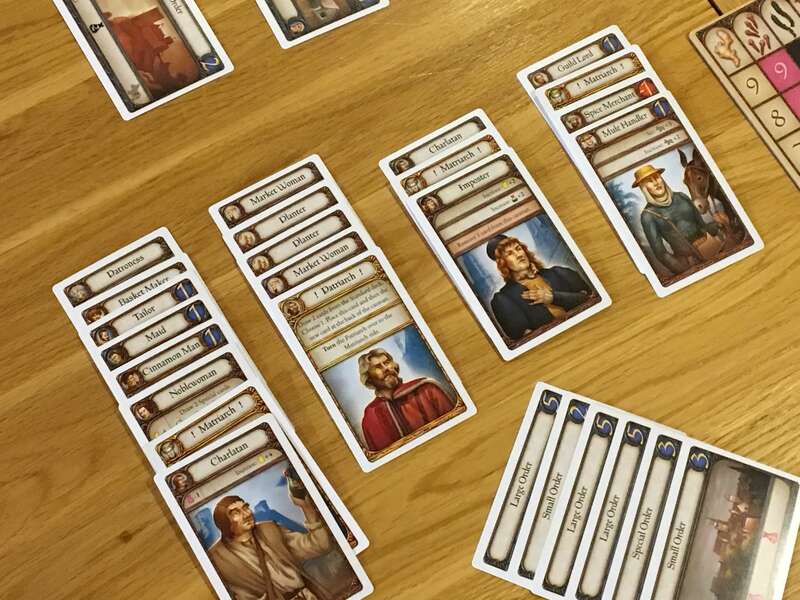 A straightforward and easy to teach deck building game that hides deeply strategic gameplay, Kashgar is a recent English adaptation of a 2013 game designed by Gerhard Hecht. Grail Games (also responsible for the superb redux of Kings Road) have left the original artwork and gameplay intact, which makes this remake an authentic interpretation of the original that has minor (if even any) deviations from the original version. Essentially a deck building and resource management game, Kashgar tasks players with the role of a caravan master who journeys to and from Kashgar along The Silk Road, trading and bartering as they go. Each player actually runs three separate caravans at the same time, but any benefits gained by them are collected and tracked on a single board per player. Every turn in Kashgar involves activating one of the caravans and taking a single action based on the top card. Sometimes this will cause the card to be sent to the back of the caravan (making it the bottom card) and on other occasions, more powerful abilities will force the card to be removed entirely from the game. The effects of the cards are myriad, but they include increasing or decreasing player resources, fulfilling contracts, adding new cards to the caravan and much more. 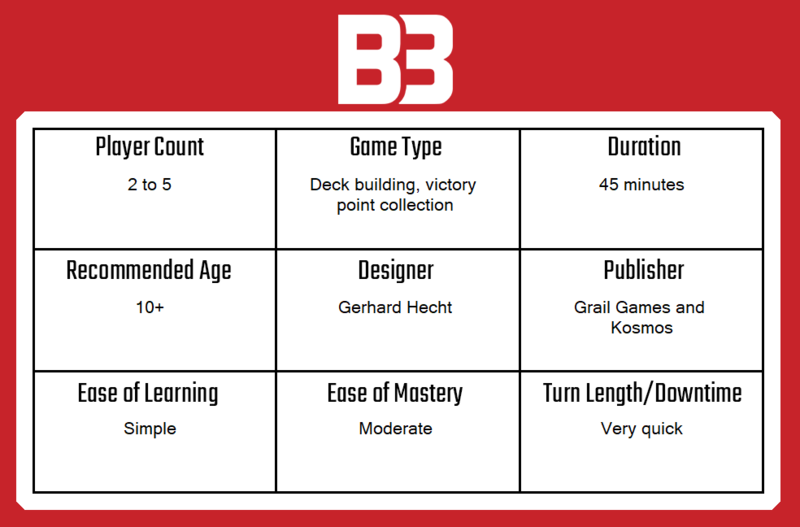 In this way, players build and cycle through their decks rapidly, expanding their capabilities whilst managing the efficiency of each action. The objective of the game is to fulfill orders and amass victory points, with the first player to reach twenty-five triggering the endgame, which simply allows all players to complete the same amount of turns. The winner is almost always the player who reaches twenty-five points, but sometimes another player will gain cards or complete an order that takes them to the same value or higher, in which case the highest wins. Games of Kashgar last about an hour, on average, which feels about right for the weight of the game play. Whilst sort of unremarkable at first, there is an honesty and a reliability to the components in Kashgar that is reassuringly familiar from the outset. The cards are larger than normal and thick cut, with characterful, understated artwork across the board. What it takes a bit of time to appreciate is that there is considerable variety among the cards but most importantly, every single one is clear in what it does or doesn’t enable. Considering that more or less the whole redux of this game has been focused on the conversion from German to English, it’s a job well done. The rules have also been interpreted in a very straightforward way that spans just three pages of a small pamphlet. The box does contain a card glossary that provides detailed rules clarifications and some examples, which was helpful. The way this worked in practice was that more or less every time that I thought I needed a clarification example – I found one. That suggests rigorous playtesting was undertaken, which is something I do appreciate and would like to see replicated into other games. In addition to the player boards, the massive number of cards (starter decks, standard cards, special cards and orders) and the manuals, there are also wooden tokens for each resource. 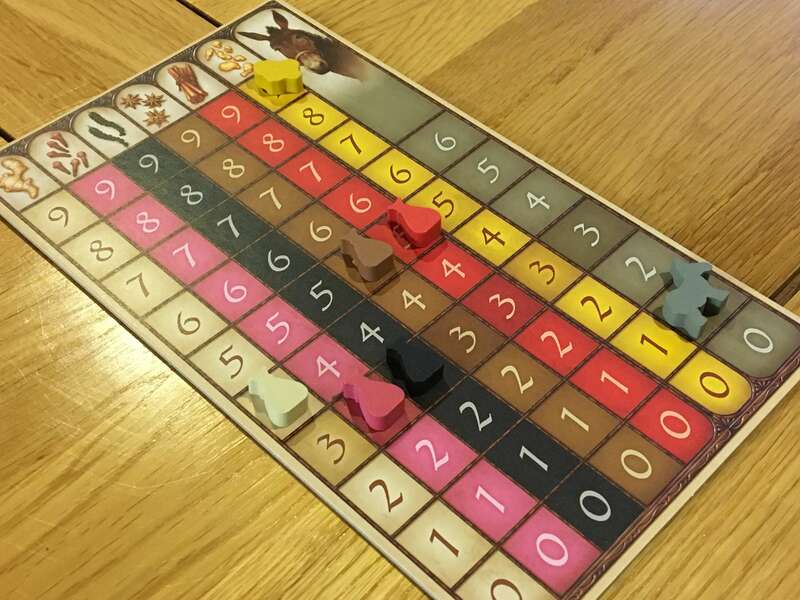 I wouldn’t normally mention this specifically, but since there’s a little donkey token and a gold nugget for each player, I feel compelled to do so. Cardboard would have sufficed for this, but it’s nice to have some tactile pieces to move around in a game that is otherwise entirely made up of cards. The speed of each turn is probably my favourite thing about Kashgar. The current player simply looks at the top card of each caravan, then chooses to take one of three options; Caravan Action, Departing Action or Pass. Caravan actions are most common and shown on the card in beige, Departing Actions appear on about half of the cards and show up in red, whilst passing simply allows a player to move a card to the back of his caravan without doing anything. With a few specific exceptions, Caravan Actions will always result in having to move the card being used to the back of its own caravan, whilst conferring some kind of benefit. All players begin with a double-sided Patriarch card, which can be flipped to its Matriarch side as a Caravan Action. In addition, its primary action is to draw two standard cards, choose one and add it to the caravan. This will almost always be the opening play for all players, but as the caravans grow larger, the followers that The Patriarch cards recruit begin to gain prominence. You may add farmers, market traders, thieves, beggars, nobles, guards and much more to your caravan over the course of the game. As these followers add spice to the player boards, the ability to fulfill contracts will become available. Doing so requires the right follower and whilst some characters can do this as a Caravan Action, others will do so as a Departing Action. Anytime a Departing Action is used, the follower who provides that action must be removed from the game permanently, whether it be to fulfill a contract or to convey a more powerful version of a normal Caravan Action. Each action takes about five seconds to resolve, so whilst it might sound elaborate, this is the whole game. Pick a card, take an action, adjust the game state accordingly and then repeat until someone reaches twenty-five points. Kashgar is the kind of straightforward, fast-paced game that is capable of hooking almost anyone, then very quickly reeling them in. There’s an almost hypnotic loop of playing actions, expanding your individual tableau and then focusing each caravan on a specific thing, like spice generation, contract fulfillment or one of the many specialised roles that do unique or unusual things. The strategic depth that play can reach is far beyond what you might expect given the speed of play, which conveys that magical “just one more go” kind of effect which all good games seek to emulate. Weighed up against the positive aspect of being both incredibly fast and extremely deep at the same time is the fact that there is barely any interaction between players at all. The game does include a twelve card expansion that introduces some elements of conflict and disruption, but it’s very light in comparison to a lot of games. As a result, Kashgar is very much the epitome of multiplayer solitaire and given the fact that the game is now five years old, I would have liked to see some well-tested variants to change things a bit. Whilst I might knock it for being a bit lacking in interaction, I think Kashgar is exceptional. The simplicity of its design – which I haven’t seen elsewhere in this form – and how it links thematically with the caravan concept is fantastic. I’m also very willing to buy in completely to any game that plays with this kind of speed, whilst still offering a rich, complex and rewarding set of choices both short and long-term as the game plays out. The card art may be a little dower, but that’s a small price to pay for the exceptional clarity and straightforwardness of using them. Although it does take up a fair bit of table space, Kashgar’s components are relatively compact, so I could see it as a viable option for travelling with, taking on holiday or in other imperfect situations where deeply strategic games tend to be overlooked. For all of the reasons I’ve outlined, I think Kashgar will remain a firm favourite among my group for some time to come. 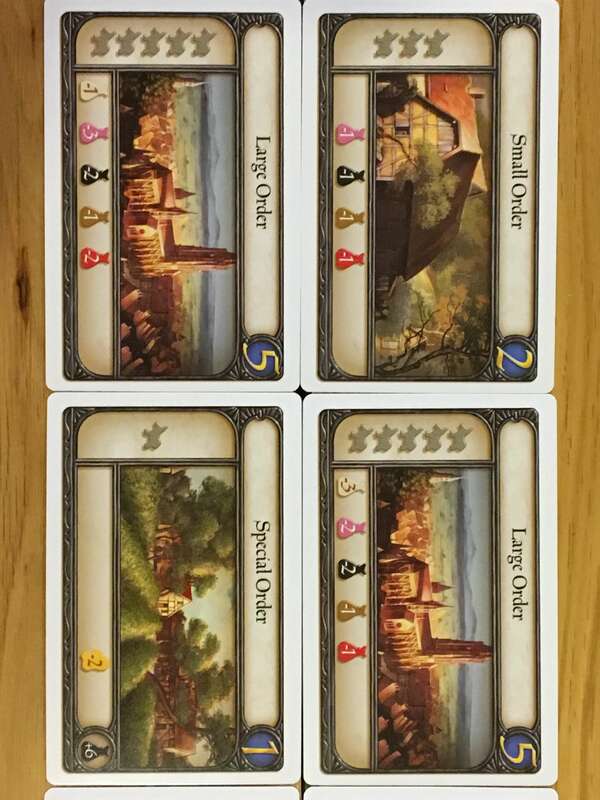 A copy of Kashgar was provided for review purposes. You can find out more about Kashgar on the website of publisher Grail Games.